When you require seating for athletes or spectators, durability matters. 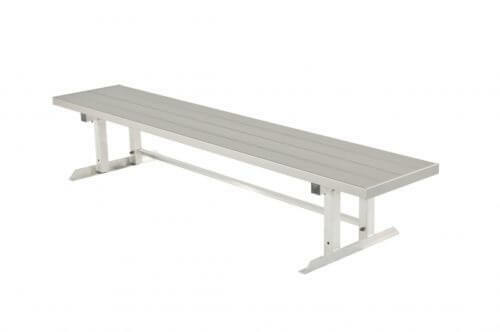 At SightlinesBleachers.com, our double team benches deliver the support needed with the power to perform you demand. They provide the perfect finishing touch for stadiums and gyms outfitted with our aluminum bleachers. SightlinesBleachers.com is a Kentucky-based company that has been serving the needs of organizations all over the country for years. With more than 30 years experience to our credit, we pride ourselves on offering only the very best in aluminum benches, aluminum picnic tables and more. Our customers can count on us to provide high quality designs that are meant to stand up to the rigors spectators and athletic teams can dish out. If you’re trying to finish off your stadium design or gym with aluminum benches, you’ll find a wide selection of models in our product line. Our benches are designed to work inside and out, depending on the model selected. Portable models – Our double team benches are designed to meet a wide variety of needs and budgets. We offer an array of sizes in portable aluminum benches. With a seating capacity that starts at five seats and goes up to a whopping 18, you’re sure to find just the right benches to meet your needs. Our portable benches are lightweight for easy transport, but are tough enough to take the punishment a team can dish out. In-ground mounting – If you need aluminum benches that can be placed for permanent installation, our inventory delivers a variety of options. We offer benches that range in size from five-seaters all the way up to designs meant to comfortably hold about 18 people. No matter how big or small your seating requirements are, we have options to suit your needs. Our double team benches are the perfect solution for seating needs because they are designed to withstand a variety of conditions and look great in the process. There’s no reason to worry about constant replacement requirements when our benches are selected. If you’re looking for aluminum benches, just browse our extensive selection for the size and design that best suits your requirements. 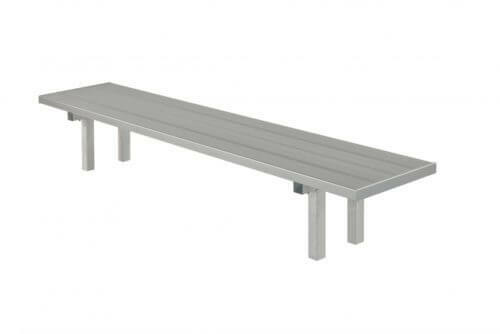 We also offer a number of other styles in aluminum benches. Our customers will discover our inventory also includes benches with back support, benches with shelving and even scorer tables. You’ll also find that we offer many other products you need to finish off a stadium or gym. From outdoor bleachers to portable viewing stands, we have your requirements covered with high quality products that meet or exceed IBC Code standards. To order any of our aluminum benches, just pick the design you want. From there, you can order right online. If you’d prefer, contact us directly for assistance with your order. You can reach us at 1-800-609-1545. We’re always happy to speak with our customers directly and answer any questions about our extensive line of products.